I’m kind of the opposite of Martha Stewart. 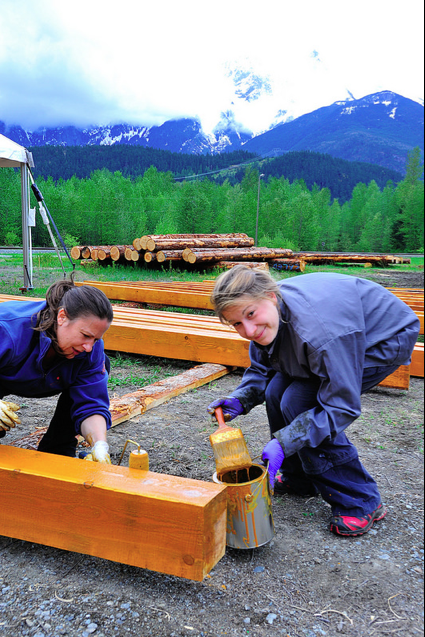 So when Niki Vankerk began posting facebook requests for tasty treats to fuel the 50 volunteer timber framers who are landing in Pemberton on Monday, 12 May, to raise us a barn, I ignored her first two posts. I figured Pemberton is full of people more qualified in that department than me. For the last 10 weeks, site prep has been underway, footings built and concrete poured, wood sourced and prepared, 350 purlins have been sawed. A fundraiser has been held. Local restaurants have planned menus and meals. Randy Churchill, a Guild member from Vancouver Island, heading a leadership crew of 8, will oversee the 50 volunteers who are making their way from as far away as Virginia, Vermont, Ontario and Arizona, to be part of the barn-raising. I sent him some questions to help flesh out a short article about the project, and the answers were so inspiring, I share them here. 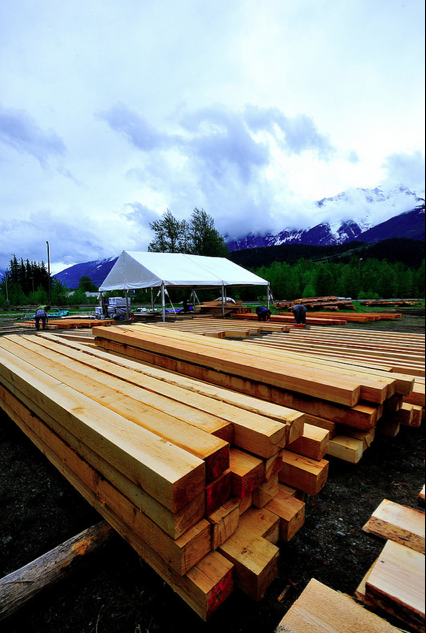 Timber framing might not have been a traditional construction method used widely in the Pemberton Valley, but the ethos of the Timber Framers is a perfect fit. Pair with Dave Steers’ photo album of the Downtown Community Barn thus far. 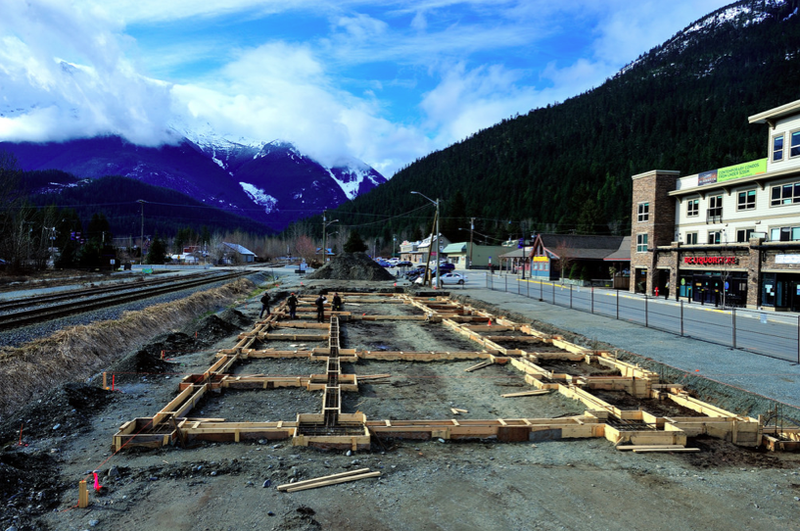 Had you been to Pemberton before committing to this project? If so, what were your impressions? I’ve been through Pemberton several times on trips to the interior, often on a motorcycle. On every trip I was inclined to spend some time and enjoy the atmosphere of healthy living and outdoor activity I see in all the residents there. Every time I visit now I am impressed with the number of people walking babies and dogs and the number of kids playing creatively outside. You owned your own timber framing company in Vermont before coming to Vancouver Island. Vermont was pretty critical to the resurgence of the craft in the 197os wasn’t it? Several very influential people in our trade were part of the resurgence of the craft in the 1970s. They were largely based in new England because of the number of structures present there from the late 1800s that were still in use and were being re-utilised as homes (ie barns made into spiritual, crafted homes.) I did not enter the industry until the 90s and salute the hard working trailblazers that re-learning a craft forgotten for two generations. What kind of days are you logging when you’re here, to raise a barn in 12 days? 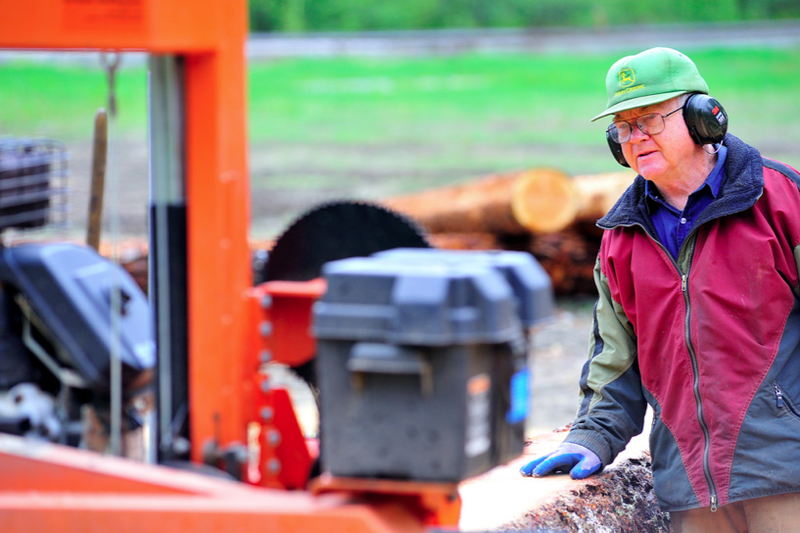 Timber farmers are a hard working, dedicated bunch of people. This type of project is a fun working vacation to us – much better than sightseeing or touristy kind of stuff, which most of us avoid. Several of our volunteers are not timber framers, but other professionals, and they commit their two week holidays to a TFG project, instead of a more conventional trip. Our crew will work hard on site because we really like working hard and know what has to be done to finish. Our days will start at 0700 with daily crew briefing. We’ll shut down and wrap up tool at 1700. Several people will additionally sharpen tools or fix things to be ready for the next day. The leadership team has a daily challenge to shuffle assignments and prepare for the next day’s educational modules, so we’ll meet before and after work each day for a few minutes. Everyone is deputized to be safety aware and we don’t want anyone overdoing it. The overall pace may appear a bit crazy, but we focus on individuals and make sure each is within a known comfort zone. On your website, in the Q+A section, you talk about our instant gratification society, and the fact that custom construction can take time and advance planning. People who are just paying attention now will see this barn go up in 10 days… but how much preparation and advance planning has gone in, to set things up for those 10 days? Approximately five person-months will go into planning for the cutting and raising event. This is spread out over a year or more, but most intensely three months before. For the month preceding the event, we’ve got 8 people working part-time on preparations. The entire crew of 50 will spend a few days getting ready for the event. Tools need to be fixed and sharpened. Camping gear needs to be washed. Trucks need to be made travel-worthy for a long trip. Paying work needs to be completed so they can disappear for two weeks. Some of the folks travelling in will be on the road a week or more to get here, driving from Virginia and Ontario and Arizona. What is the motivation for people to attend a workshop like this, with their personal vacation time? Are most return volunteers who’ve been on other projects? Half of the crew will have previous project experience. This is a hard project to get to for most of our membership – for pure distance. For some of our other projects, the return rate can be 75%. the educational opportunity of the project. Everybody learns something, no matter how much of a wizard when they start. Most of our crew lead exemplary lives in terms of attention to family, work and social ethos. We all find gratification in being around others we enjoy and who enjoy working on something tangible and challenging with us. The satisfaction of creating something large and unique is special. We build buildings, but we also build community. If you could describe the typical person drawn to the craft of timber framing, what characteristics or interests would they share? 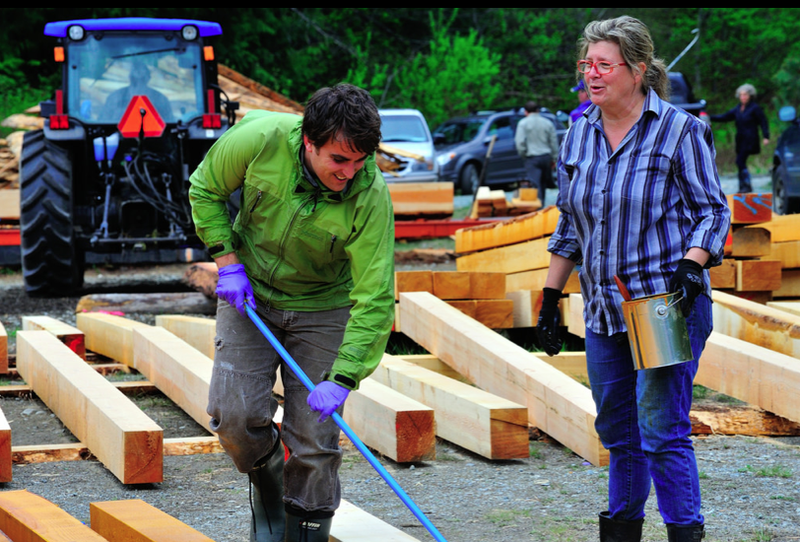 Why is community such a big part of the Timber Framers Guild’s focus? (Is it because it was originally a true artisan craft, which survived through information passed diligently from master to apprentice? So, it kind of needs the energy of people, or a person to person transmission, to stay vital?) Or because you can’t just raise a big log without many hands? Timber frames have an embodied spirit and character unmatched by other building methods and materials – think concrete, steel and drywall. Creating those special buildings requires careful attention to craft and an awareness of Nature that many folks have seemingly lost. Each piece of wood is unique and deserves a special location in the make-up of the frame. We think the same about our friends and people new to the craft of timber framing. Each person has something unique to offer, whether they be old and wize or just getting infected with the TFG virus now. Our timber frame structures are reflections of our lives and work – we want them to be long-lasting, filled with spirit and character. Working with heavy pieces of wood requires humility and challenges your brain in a very good way. Is there a modern day equivalent to the barn-raising? Apart from these occasional projects that you guys run, how else do people get to experience that kind of phenomenon? Do you think part of the magic of the experience is that these events are rare, but we still retain some ancestral memory or longing for them? This kind of project is very rare – and people love to be a part of it. Other examples exist in pockets of society. Some religious organisations hold similar work parties. Habitat for Humanity is another example. There are others, but they are pretty rare. 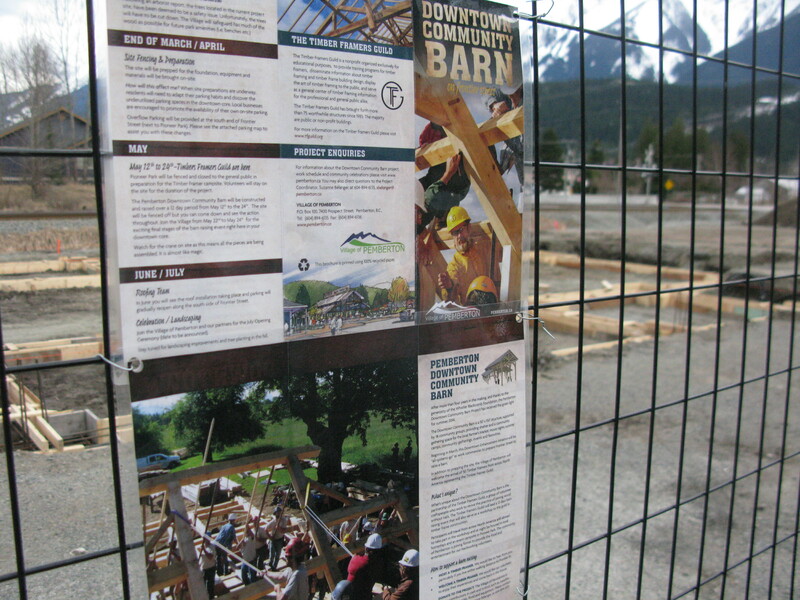 What is the depth of the BC timber framing scene? How does it compare to Vermont/the North East? Given that the province has such deep logging roots, would you expect more reverence for wood craftsmanship? Finally, do you have funny outfits? I went to a wedding many years ago, where the groom was a graduate of Northwest Community College’s 13 week timber frame craftsman program and his best men wore outfits that looked like they were out of a medieval movie. Do you enjoy being connected to a tradition with lineage? Tradition and history is a big part of our interest in the craft. There are many amazing old buildings that we learn things from. Some of our brethren craftpeople have long histories in other countries – Swiss, German, French, Japanese, Chinese, English, Norwegian, others. I am not formally trained in the trade so don’t have a traditional outfit. My edification has been more chaotic and random, and I am jealous of any young person that has the opportunity to learn a quality trade. We actually don’t get too formal about that. We’ll leave most of that to the Village, if they want to do something. The Village is proving to be a terrific partner, that’s for sure.